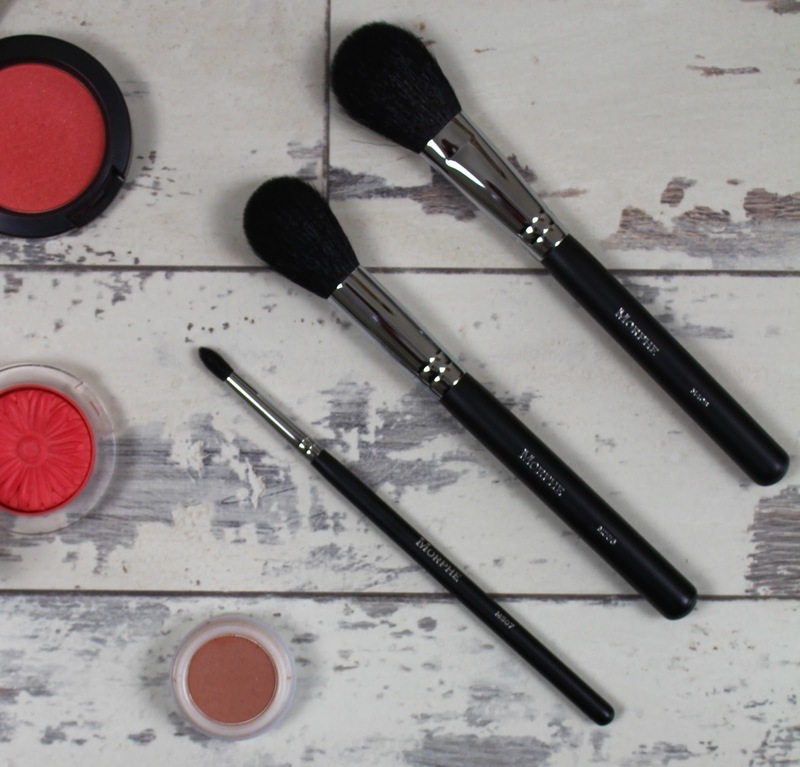 Living in Makeup: Morphe Brushes: Worth the Hype? Morphe Brushes: Worth the Hype? Morphe Brushes have been everywhere online. I've seen many a review pop up in my Bloglovin feed so naturally, I had to snap up a few. I purchased three brushes, the M507, M556 and M403. This little eyeshadow brush is fluffy yet perfectly tapered making it easy to fit into the crease and precisely apply colour. I really like using this for darker shades because it allows me to slowly build up colour and gives me more control. I've also found it brilliant for smudging colour on the lower lash line. Since it's so soft, it blends the shadow beautifully and creates a very soft blown out look which I love. I picked this brush because I thought it would be perfect for setting concealer under the eye and for applying highlight to the cheekbones, and it is. However, it's no better than my other brushes and if I'm honest, I'm a little underwhelmed. I don't find it blends the product that well and it leaves a powdery finish to the skin. I can't put it down to the products I've used because they're tried and true favourites. I'm quite disappointed with this brush. It's soft enough but I do have softer brushes. This is a fluffy brush that has very flat sides so it can be used for so many things. You can use it for blush, bronzer or even contour because it's tapered around the edges. Despite this, it still doesn't wow me. It doesn't blend product well, in fact you could see the lines of bronzer and blush on my face which I hate. I prefer a seamless finish where you can't tell where the product starts or ends. I just couldn't achieve that with this brush. Like the M556, it also left a very powdery finish to the skin. I'm impressed with the eye brush I have but the two face brushes are really disappointing to me. They're not as soft as I anticipated and not as good as my Zoeva brushes. They wash well and become fluffier the more you use them, but they don't get softer.